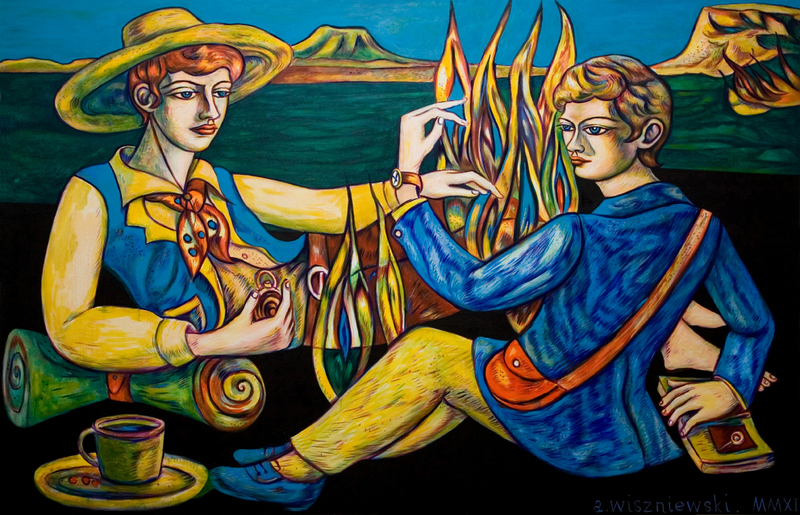 Two wistful young men making enigmatic hand gestures, awkwardly recline by a campfire in Adrian Wiszniewski’s idiosyncratic painting The First Anachronism of the Day. It is rendered in a graphic, illustrative manner, and could be a relic from the 1980s, when neo-expressionism and a revival of allegorical figurative painting was prevalent. But it was made in 2011. As a bold opening picture, hung to greet visitors at the entrance, its title appears to be a clue to the curators’ intentions. This multi-generational group exhibition showcases a multitude of positions within painting today, yet the selection of all-living artists is surprising and intriguing. As Wiszniewski’s piece suggests, there are apparent anachronisms throughout the show. 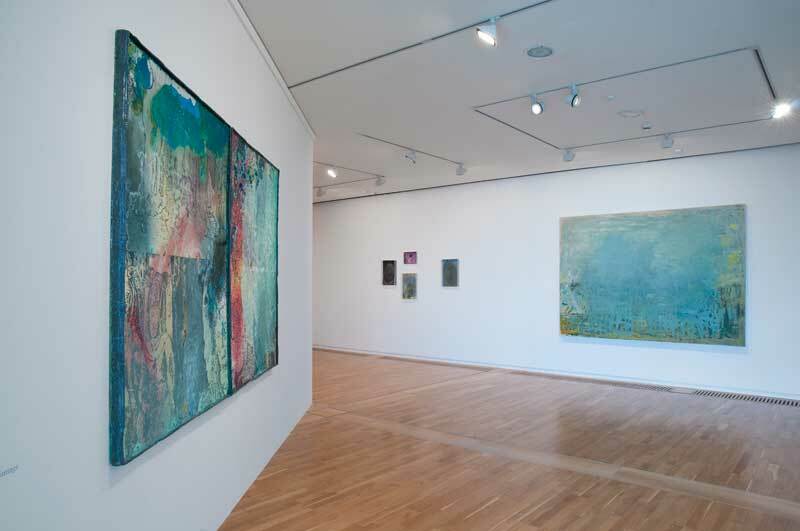 Large colourful and gestural abstracts by veterans Jeffery Camp, Gary Wragg and Frank Bowling, have the characteristics of Abstract Expressionist era painting, yet possess a present-day vitality, as all were made in the last couple of years. Cherry Tree, and Young Girl, a recent work by Leon Kossoff, is painted in thick impasto and delicate hues; the style he has been developing for more than half a century. Yet there are plenty of works by younger artists too. 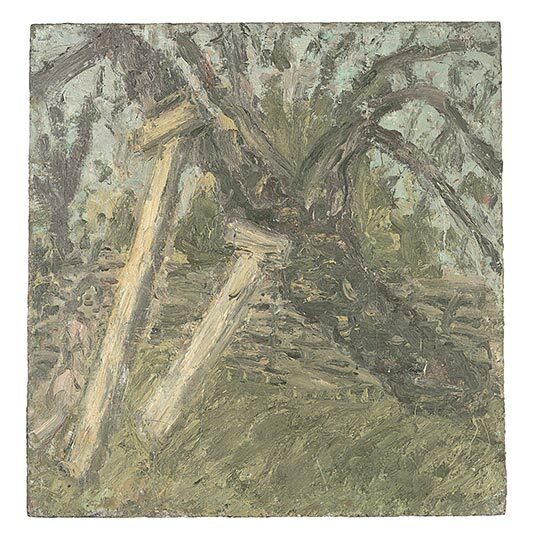 Hayley Tompkins’ No Title – a real twig with buds, painted bright green, contrasts Kossoff’s pale old leaning tree, propped up on stakes. Tompkins’ twig looks more like contemporary art; it proposes a sculptural alternative to canvas with the lightest of touch. In a separate open plan gallery upstairs, an enormous painting by Bruce McLean, depicting an abstracted atelier interior, informally leans against the wall. 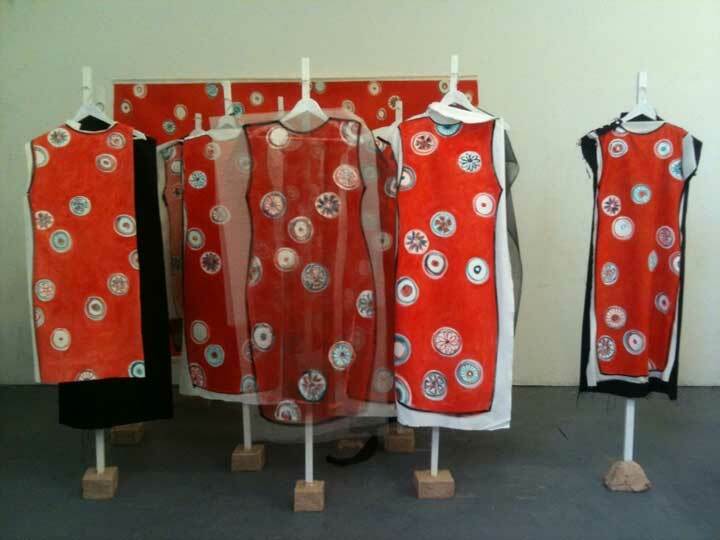 It acts like a stage set for a separate installation of wearable dress paintings by Lisa Milroy. This set-up offers up-to-date dialogue on the active life of painting, as immersive environment or interactive object. Further paintings by Sophie Von Hellermann, Phoebe Unwin, and William Daniels, may impart a certain glamour to those who recognise their work from the likes of the Saatchi Gallery. 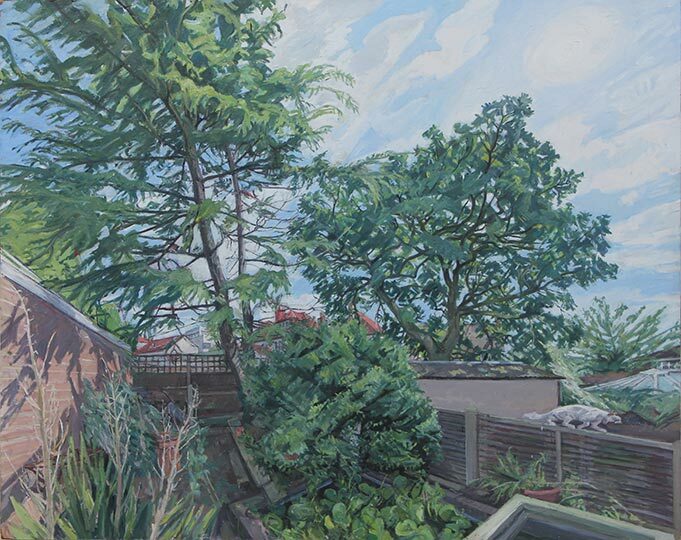 Yet these hang alongside highly traditional inclusions by John Wonnacott, who has notably painted the Royal Family. But when everything on display mingles effortlessly – albeit unconventionally – picking apart what is ‘in’, and what could be deemed passé becomes meaningless. Instead connections can be made unreservedly. ‘I Cheer a Dead Man’s Sweetheart’ is an unusual show in an unusual location. The De La Warr Pavilion is a listed modernist building on the Bexhill seafront. Although the exhibition makes no overt references to the iconic architecture or maritime setting, there are a few subtle connections here and there. Jacqui Hallum’s ethereal painting Like Reading and Extension of Dreaming for example, which conveys a sensation of melting stained glass, was bathed in a salt solution at the final stage of making. Blue crystal formations on its surface continuously respond to atmospheric conditions. The exhibition catalogue indicates that the work by this locally-based artist is included at a crucial stage in her career. It hangs near a classic by Frank Auerbach, yet Hallum’s painting reminds the visitor of their whereabouts, and the humid South-westerlies which blow against the expansive sea-view windows. There is a further peculiarity to this all-embracing profile of current painting practice, and that is a sense that the selection of artists and paintings was a distinctly personal choice. The absent work by co-curator Dan Howard-Birt could be the missing link. For a large institutional show it is winningly eccentric – and isn’t this what much of the best of British painting is? ‘I Cheer a Dead Man’s Sweetheart’ is at the De La Warr Pavilion, Bexhill on Sea, until 29 June.